I already reviewed the bigger Denon Envaya DSB200 which was introduced earlier this year and although I found it to be quite a solid performer, it didn't knock my socks off. My favorite speaker by then was the Soundlink Mini which was considerably smaller but managed quite a similar sound. Although both were tuned differently, I couldn't discern any real advantage in sound if I chose the Denon Envaya over the Soundlink Mini with a similar boomy bass and similarly muffled treble, except a slightly higher overall loudness but at the same time ending up with a much larger speaker. Now the smaller brother of the Denon Envaya, the "DSB100" was announced recently without making big waves about it as I only managed to hear about it per chance. I became really curious to hear what Denon managed to sequeeze out of a speaker that small, as they don't seem to be a company to contend themself with little. Let me tell you that this is finally the speaker which indeed managed to blow my mind more than any other portabler speaker I have tried in the last years. Come in to find out why. Some years ago most compact portable speakers up to larger book-sized ones sounded rather tinny and unimpressive like the original JBL onTour (a kind of pocket flask) although it was very popular by then and still got pretty great reviews while in reality it was a bright thin sounding speaker, which I would have never had considered for listening to music. Maybe the Soundmatters FoxL and later the Jambox which was based on the same internals of the FoxL were the first that started a kind of small revolution for the entire Bluetooth speaker market about 5 years ago. The FoxL was pocketable and probably the first speaker which really delivered a bit of a Hifi-sound, at least at that time, but all speakers that small didn't even manage any real bass response, the FoxL on the other hand sounded much larger than the size would suggest, especially when positioned well near a wall or corner. A battery used as passive radiator was pretty unique at that time to overcome space-limits, then suddenly nearly all small speakers started to use some kind of passive radiator to enhance their low-end. Looking back now, the FoxL still sounds rather tinny with a quite low maximum output, compared to what is available now. It sounds balanced overall but is still missing the bass-punch of most current speakers. When Bose finally launched their Soundlink Mini 1 year ago (with 2 opposing passive radiators instead of one) they seem to have shifted physical limits of what was possible to squeeze out of a compact speaker on sound. The Soundlink Mini has a cubature of less than half a liter, but manages to play down to 60Hz. Unfortunately Bose preferred to produce too much bass instead of too little, so the Soundlink Mini suffered from quite an imbalanced sound in the end with boomy bass but muffled upper treble and a stronger lower treble boost instead, to divert from the fact that the Soundlink Mini had hardly any upper treble at all. The overly boosted bass came not without problems as deeper bass notes tended to drone on many songs already at half volume with intermodulation distortion creeping in at higher levels. Despite all the flaws Bose succeded with their concept anyhow, as the Soundlink Mini is still selling like hot cakes. Even I enjoyed it for some months and was really impressed about the full sound it was able to produce, but at the same time I already started to complain about it shortly after I had bought it. Since then other companies tried to jump on the bandwagon and issue their own versions of the Soundlink Mini, but most did not even come close the "original", let alone improve on it. 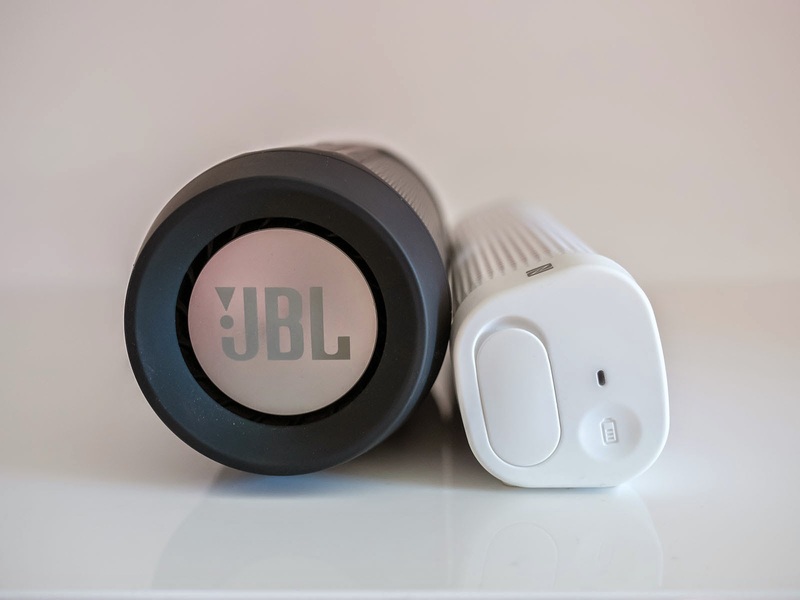 Finally JBL managed to offer a worthy alternative with the Charge 2, which on the other hand was plagued by some unforeseen DSP artefacts and yielded the speaker nearly unusable in many cases or with particular tracks. The key to success for such small speakers is the perfect interaction of acoustics, drivers, manufacturing and probably most important DSP. A small driver will never be able to produce any low frequencies on its own without some further equalizing and dynamic adjustment etc. But many companies still seem to be ignoring that fact and launch new speakers that could sound so much better, but do not because you have to turn them close to maximum in order to get a satisfying response. Listen at lower levels and they will sound like a clock-radio, an extreme example being the Klipsch KMC-1 which didn't manage to sound really much better than the small FoxL until you turned it up to at least half volume. A DSP is necessary to "model" the sound accordingly and push the drivers to their limits, otherwise a speaker that could play down to 150Hz without any distortion at maximum volume, will never sound full-bodied or mature at lower levels, if the bass-amount below 150Hz is not pushed at the same time. Denon seem to be the ones who are well aware of that fact and the Envaya Mini is the best example for perfect interaction of all speaker components including the DSP. Enough history and technical blah, let's have a look what we have here. The Denon Envaya Mini is quite an affordable offer within the confusing Bluetooth speaker market. It is available in either black or white, I chose white because this should be more forgiving on a hot summer day when the sun is burning down on it. Retail price is 99€ in Europe, but it is already sold for 89€ by some vendors (with some temporary offers for 79€) making it considerably cheaper than the Bose Soundlink Mini, which can be found for as low as 159€ right now. I am not quite sure about the price in the US, but it seems to be priced higher with 149$. This would make the speaker indeed more expensive in the US, than in Europe, usually it is just the other way round with a 1$=1€ conversion. Initially I really assumed the Envaya Mini would cost 99$. But I think even for 149$ Denon offered a really competitive package here. for 89€ it's a steal, and I am astounded they didn't already price it higher from the beginning. 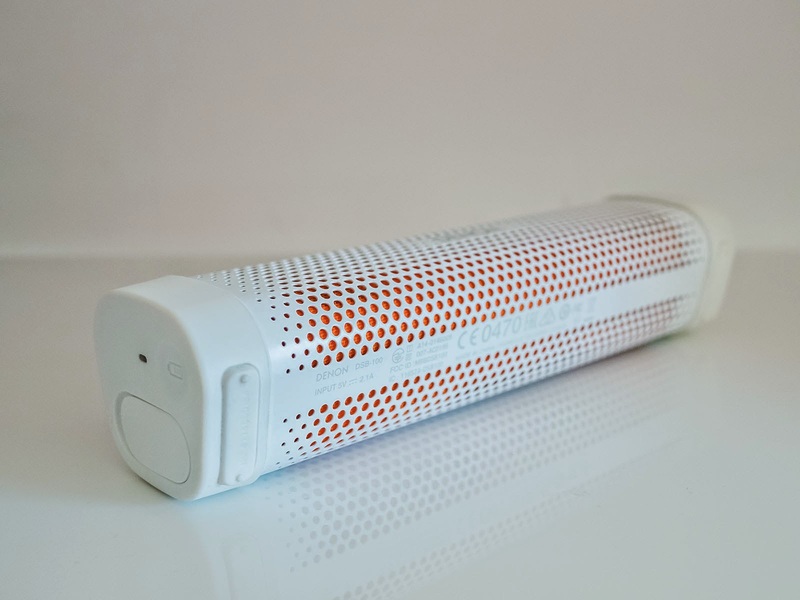 It makes such speakers as the UE Miniboom, or Jabra Solmate, or some other no-name junk priced close to 100€ really appear embarrassing and obsolete. Maybe this is what Denon intended, but they did it with some real understatement unlike many other companies, which promise "big bass, room-filling sound" but everything you get is only some fart. Inside the box, which is simple but well designed you will find the speaker and a USB-cable among some quick-guides and security notes. There is no charging unit included, so you will have to use your own. 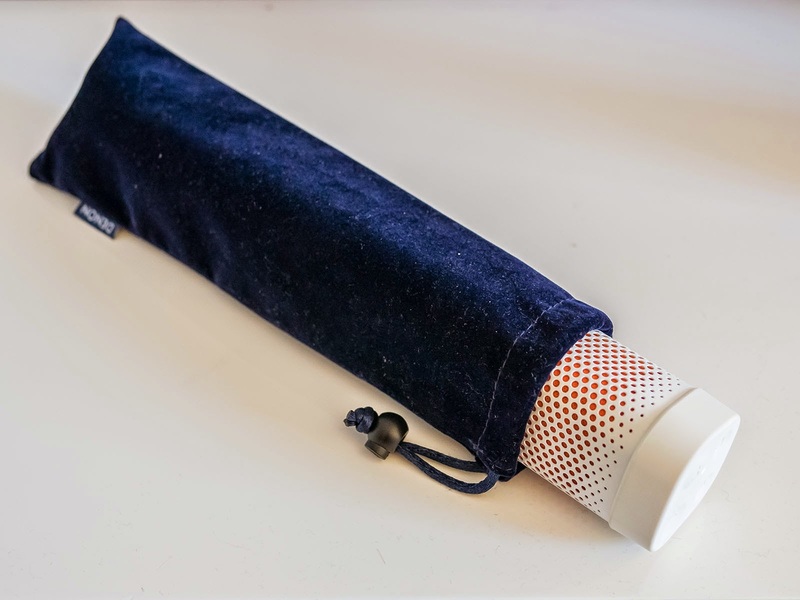 At least it comes with a darkblue plush carrying pouch, which can be even used with the speaker playing from inside, as the used material seems to be quite transparent acoustically. Inside the bag you can let the speaker hang somewhere thanks to the closing-lace. The Denon Envaya Mini is splash water resistant. This means you cannot submerge it under water, but it doesn't matter if it becomes wet or if you operate it with wet hands etc. (IPX4 certified). It is not quite "mini", but it is really slim, making it appear much more compact than it is. It has about half the diameter of the JBL Charge 2 and it is also slimmer than the Soundlink Mini, but it is a bit longer at the same time. The measured cubature is exactly 0.43l, which makes the Envaya Mini even slightly smaller than the Soundlink Mini and 160g lighter. 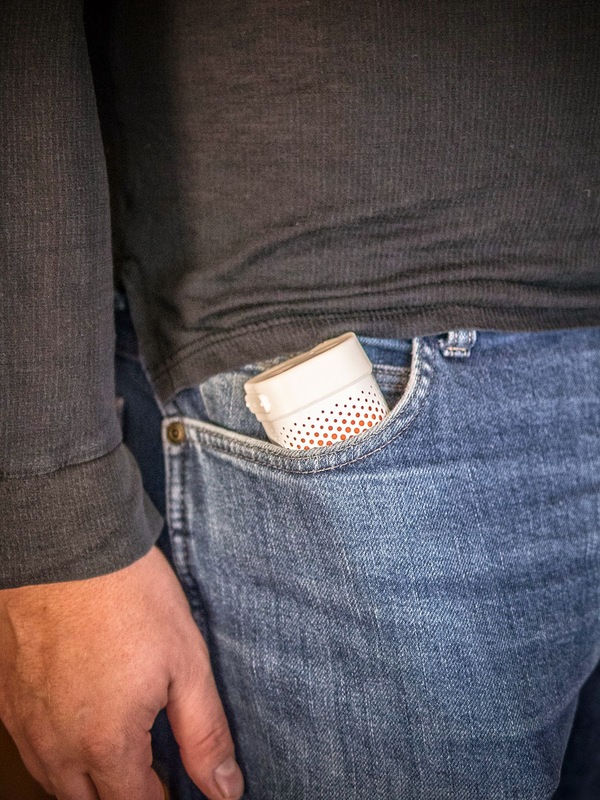 The JBL Charge 2 is 70% larger, the original Jambox is 25% smaller, but in contrast to the Jambox, the Envaya Mini could nearly be called pocketable due to the rounded edges if not the added length, because it will stick out of most pockets and obviously laying it on thick when carried inside some trousers. The Envaya Mini feels really sturdy and heavy, although it is lighter than most competition including the Soundlink Colour, it makes you think it is heavier maybe because of the massive metal housing, while the Soundlink Colour is a bit plasticky. The Denon Envaya Mini doesn't give the impression of being easily damaged or dented, even without any protection, if you are still unsure, just use the included pouch before tossing it inside a bag. The speaker grille is a thick metal part surrounding the entire speaker which yields just slightly and only with some stronger pressure. Both speaker ends are covered by plastic/rubber caps containing the ports at the left side (microUSB for charging and 3.5mm auxiliary input) covered by a protective flap. At the left you'll also find a battery life indicator, which will light up for some seconds when the additional battery button is pressed. There are 3 distinct charging levels available, green will symbolize 70-100%, orange 30-69% and red a level below 30%. The light will start flashing red continously if the battery reaches 5%. All main speaker controls are at the right side with a very simple layout. Just 4 buttons, one of them being the power-button which has to be kept pressed for about 2 seconds in order to turn the speaker on or off. Below is the play/pause button which can also be used for answering calls or skipping tracks forward with a double press and backwards with a tripple press. The play/pause button also acts as pairing button when kept pressed for some seconds. The volume-buttons are differently cuvred, so you should feel where to press to increase volume without the need to look at it. The buttons need some stronger force to be operated as they are on the speaker-side you'll need a second hand to hold the speaker firm in order to avoid pushing it around, or just grab it with your hand and do all adjustments holding it in your hand. Volume control is not mirrored between streaming device and speaker and the Denon has 100 distinct volume steps just like all Bose speakers. Even volume levels are quite comparable which means the Denon playing at 60%, will play more or less at the same loudness as the Bose at 60%. Not only that but also status tones seem to be inspired by Bose. When a Bluetooth connection is established you will hear nearly the same tone you always get on all Soundlinks too. Apart from that coincidence Denon doesn't try to copy Bose, but rather improve on that and do their own thing which is good. The Envaya Mini will also play an own power on/off tone, a kind of chord-arpeggio which is a bit annyoing as it is too loud for my taste. I would have preferred it completely without any tones, but obviously I will have to live with it, at least it doesn't talk or play cheesy melodies. The Denon Envaya Mini can connect to 2 devices simultanously. The first device has to stop playback though, in order to enable the second device for playback. The new device cannot take over the playback of the previous one on its own. Unfortunately the Bluetooth pairing logic as a whole is not very aggressive. 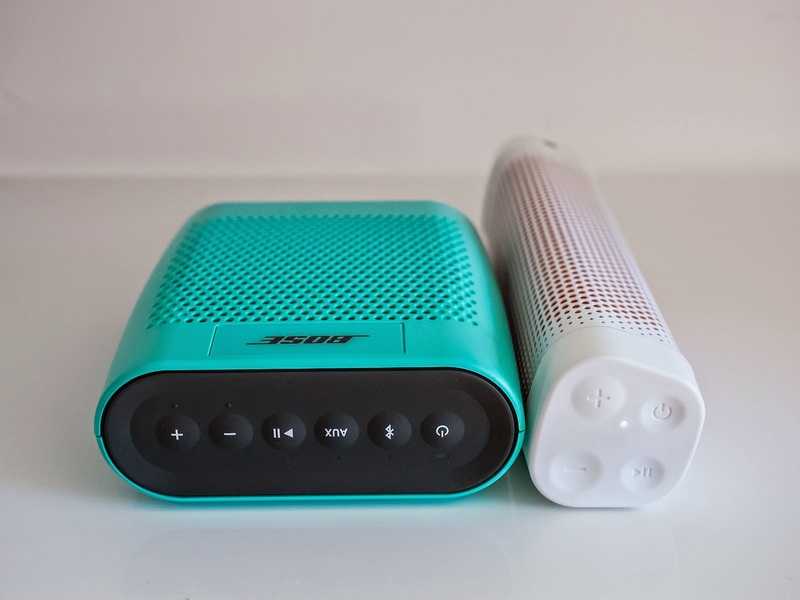 The Envaya Mini always tries to connect to the latest device only unlike the Bose Soundlink Colour for example which will always automatically connect to both found devices simultaneously. On the Denon you have to force the connection in case it was connected to another device before, it wil simply ignore all other already paired devices. It might be different with pairing through NFC, but thanks to Apple I cannot talk much about that. According to the manual the speaker will even automatically wake up from standby if you tap your NFC-enabled phone on the NFC-logo. 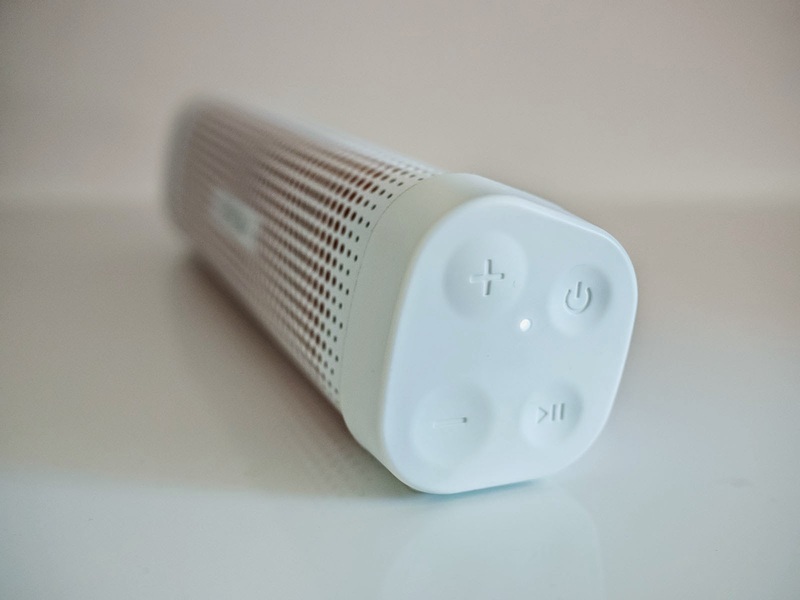 The speaker will auto turn off after 15 minutes if no Bluetooth stream is currently being played. When connected to Aux, it will turn off after 8 hours, this can be disabled completely by holding the battery button for 3 seconds assumed an aux-wire is attached and might be helpful if you want to use the speaker as an alarm with your phone attached to it. Attaching an aux-wire will disable Bluetooth, there's no need for any further Aux-button. It seems though, there is a small bug with the auto power-off function. Normally the speaker will turn off on its own after 15 minutes when Bluetooth streaming has stopped. 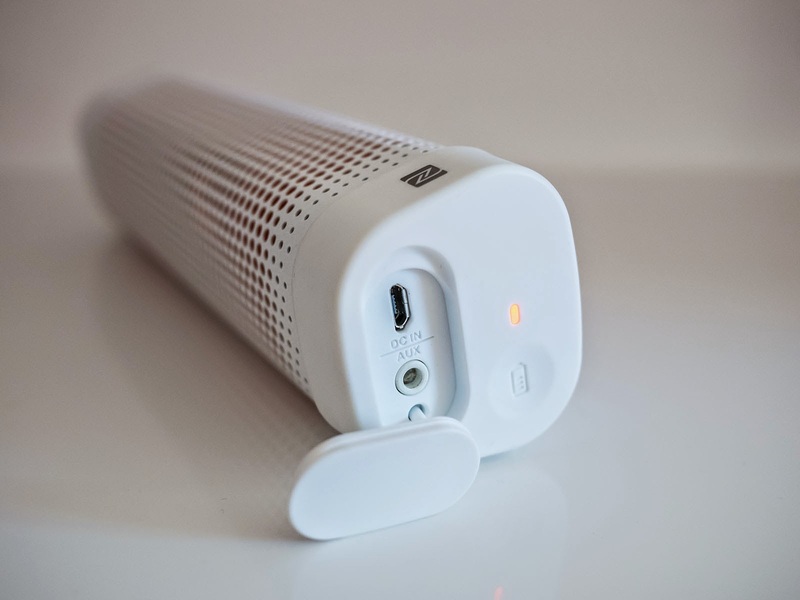 But when 2 devices are connected to the Envaya Mini while the connection to the first device is lost, it will neverthelesss jump into power-off mode, even when the second device is still currently streaming. The Denon Envaya Mini supports all possible Bluetooth codecs including AAC and most important for all Hifi-junkies: low-latency AptX for nearly lossless streaming. I found Bluetooth connection to be extremely stable (maybe even best in class) and with the speaker standing in our most distant room, I could stream music from within all other rooms with only some occasional hiccups. The Infinity One already struggles at half that distance. Unfortunately there is no support for wireless stereo pairing with another Envaya Mini. This would be really great, but at least you can renumber their names with some button-presses if you intend to own a couple of them for not to confuse them inside your Bluetooth-list. They can be named Envaya Mini up to Envaya Mini4. A pretty unique but definitely helpful function if you really own more devices. I have two TDK A12 for example and I never know which one to select from my list in order to connect to it. Battery-life is claimed to be up to 10 hours. I made some tests and got close to 9 hours at exactly half volume, which means at volume step 50/100. I also did a test at maximum volume and the speaker turned off on its own after 2:40 hours. Some others report 5-6 hours at higher levels around 2/3, but please keep in mind that for best results you have to control the volume directly from the speaker. Some tend to keep the speaker at maximum all the time and control the volume directly from their streaming device, although this doesn't have any effect on sound quality in case of the Denon Envaya Mini, it has a big influence on battery life and I had done some tests to prove this. At volume step 50/100 I go exactly 8:33 until it turned off on its own, for my next test I left the speaker at 100/100 but reduced the volume on my iPhone instead to get exactly the same loudness as before (I double-checked the loudness with another unit that was set to 50/100). With the Denon Envaya Mini maxed out I suddenly only got 5:11. Just the fact that the speaker was playing at maximum, while still delivering the same medium loudness as before reduced the battery life by 40%. If you remember this, you can definitely improve your battery life, as more and more owners are complaining that they can't reach more than 5 hours at low levels, but I am sure they simply keep their speakers at maximum all the time. Although actual battery life does not sound impressive it is much better than the 50 minutes I got from the B&O Beoplay A2 when it suddenly dropped the volume to half. The Denon does not reduce volume on its own, nor does the sound deteriorate in any way when the battery becomes low, it will play at full-blast until it turns off. Charging took 2 hours with a 5V/2.4A USB-charger. According to the manual it should take around 2:30 hours with a 2A charger. Battery life is definitely not hopeless, but be prepared to charge the speaker every day if you intend to use it often especially at higher levels, and trust me, you will! You won't get the impressive battery-life of the Fugoo, which I only charged once a week with similar usage neither that of the JBL Charge 2 which also has a stronger battery built in as it can also charge external devices. Thanks to its standardized 5V input, you can always charge the Envaya Mini with some external power pack in case of emergency or simply plug it into your computer, or charge it in your car. So far I didn't encounter any battery problems under normal usage, but I noticed that the red blinking light started to appear earlier than I expected. 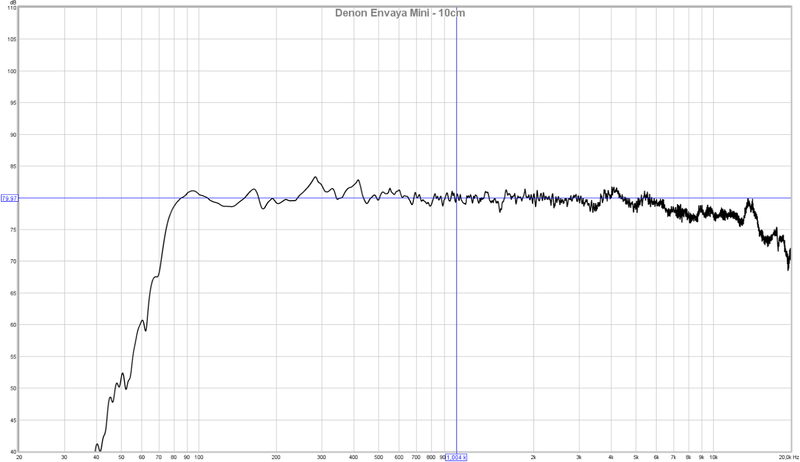 I think I managed to cover all the basic stuff and as you can see there's nothing exceptional here, therefore let's directly jump over and discuss the sound qualities the Denon Envaya Mini has to offer. Describing the sound with just one word might not be easy, but I would probably use the term: stunning. Of course the sound of this minuscule speaker cannot compete with any full-grown stereosystem, but given the limits it is impressive what Denon managed to squeeze out of it with just 2 4cm full-range drivers and a twice as large single passive radiator. I am not sure how many different speakers I have heard during the last years, but the Denon is one of the few which really managed to make me speechless. It does not have the strongest bass, nor is it loudest etc. It is just the fact that it is tuned so well, close to perfect, that really makes you smile, I guess the Envaya Mini is the first mini speaker that can really deliver a close to hifi-experience within its limits of course. The Envaya Mini is not deficient on bass by no means, especially not considering its size or when looking at most other similar offerings, but don't expect the same unnatural bass-boost as that from the Bose Soundlink Mini. Also the JBL Charge 2 or the Sony SRS-X3 will sound more full-bodied, but unlike with the JBL Charge 2 wich has a quite natural sounding bass response, you will hear that the bass of the Sony and the Bose is just bloated, but not very precise or much deeper. 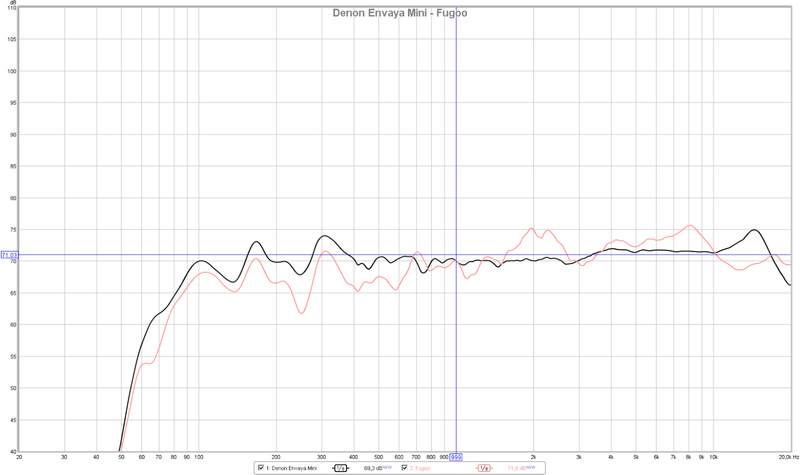 The Envaya Mini has a very flat response down to 80Hz and rolls-off stronger below that. It gives you the impression of a grown up speaker unlike all other small speakers, which just continue to sound like clock-radios. Bose and Sony seem to have managed a deeper bass response, but in reality it is just a stronger overall boost. I guess Bose had to boost bass that much in order to make it extend deeper, while Denon on the other hand managed a similarly deep roll-off like the others but at the same time they kept the bass pretty flat. It sounds just "true", not too much not too little, it integrates with the music and doesn't play along or even drown out the mids. Bass could be always deeper of course, but then such a nice overall tuning probably won't be possible inside a such small speaker. I really welcome this flat response, as the Envaya Mini sounds considerably more balanced than the bigger Denon Envaya, which had a similar bass-boost as Bose, and treble response was far not as impressive as from its little brother, because it is not only bass-response which is pretty solid for the size, the Envaya Mini continues to sound good up to the highest frequencies with only some slight boost at around 15khz. Treble is crystal clear particularly when listened exactly on-axis. The speaker drivers are tilted slightly upwards, thus allowing better focusing of treble in case the speaker is placed on a table below with the listener sitting above. Although treble is quite directional, the Envaya Mini is not completely lost if not listened directly on axis. You will lost all the sparkle, but it will still sound pretty clear even from a higher angle. The Bose Soundlink Mini was totally hopeless in this regard, although the JBL Charge 2 has still a less directional treble response. I am quite sure there will be enough people who will complain about lack of bass, while others will complain because of too much like my wife who claims it to be too bassheavy for her taste. I think it is just spot on, if you need better bass (not more) then you will have to look at larger sizes like the B&O Beoplay A2 for example. When I turned up the Denon Envaya Mini for the first time and listened to some familar recordings, I immediately felt "at home", it sounded right and I didn't even bother listening closer to find some inconsitencies. I liked the sound that much that I continued listening to it until 4:00 in the morning, because I wanted to know how this or that song would sound through it. I couldn't stop being impressed when looking at the small box standing in front of me that was able to produce such a big sound. I also tested lots of different placements and found the Envaya Mini to be not very critical regarding positioning. It doesn't have the tendency to sound boomy even at the most disadvantageous places. Thanks to the single passive radiator at the back the Envaya Mini tends to vibrate quite a lot. Usually this shouldn't be a problem though, as the rubber-feet at the bottom absorb all unwanted vibration really well. Even at highest levels with the bass heaviest tracks the Envaya Mini shouldn't rattle around against the base. The vibration can become really strong and could probably compete with any women's toy, but it is remarkable that the speaker still seems to have everything under control, without any unwanted rumbling inside or outside the body. When cranking the FoxL to the max (which of course doesn't even reach the same loudness of the Envaya Mini) you could easily feel that it was already far beyond its limits with the mass of the passive radiator taking control over the whole speaker. The Envaya Mini doesn't creep or dance around, even when I tired putting it on some slippery table it stayed still unlike the Fugoo which had a slight bias towards creeping, despite having 2 opposing passive radiators built in, obviously they were not congruent with each other. Keep in mind to place the speaker directly on its rubber feet without touching other objects, otherwise it will rattle against them. Thanks to the feet the speaker is elavated a little bit, but if you try putting it on some bumpy ground, the main body might still touch the base at some parts and start rattling or consequently becoming scratched. I would avoid putting it directly on concrete without any additional supporting cloth or material. To be sure I also did some heavy back and forth switching between different speakers during my extensive listening tests only to discover that the Denon held up pretty well with even the larger and much more expensive ones. Just on bass-response alone the Envaya Mini is on par or better than most bigger popular speakers like the TDK A33 or Soundblaster Roar, funnily it even outperforms the B&W T7 if you listen at normal levels, it cannot compete in overall loudness of course. In fact I would claim the Envaya Mini to sound considerably more impressive than most speakers in the class above let alone its own class including toys like Jabra Solemate, or Teufel Bamster etc, which just cannot compete in any way with the Denon Envaya Mini soundwise. So far I really liked the Fugoo quite a lot, not only because of sound, but as overall package it was quite an appealing speaker, including great battery life, ruggedness etc. But putting the Denon Envaya Mini against the Fugoo, you will immediately notice that something's not right with the frequency response of the Fugoo. The Denon will sound more mature, more natural and will play considerably louder without any distortion. There is some serious bass-punch noticeable with the Denon, while the Fugoo despite having a nice deep bass thump is rather lacking on overall bass-amount, especially if you start increasing volume past half. The Denon was impressive because regardless of loudness level it always remained controlled. It sounded full-bodied and warm at lowest levels, and it sounded competent at maximum volume without even the slightest hints of distortion or any noticeable dynamics compression. I am not sure if it really applies any kind of loudness-compensation, but regardless how soft or loud I tried to listen, it never became anemic sounding. I did not notice any intermodulation distortion either, the Denon will sound the same at low levels as it does at high levels with only some bass-reduction but it will never give you the impression as if it was already close or beyond its natural limits. Although the Bose Soundlink Mini might sound more serious on the first listen, you will quickly notice problems with low frequency distortion including some intermodulation into the higher frequencies at half volume, while the Denon will remain perfectly clean, I am not even mentioning the rather muffled treble response of the Bose. The Envaya Mini can even compete with the 3 times bigger Infinity One to some degree. The Infinity One has a stronger bass punch for sure (it has a similar bass-boost as Bose), but the Denon sounds more natural and even larger in regard to its sound-stage. I didn't mention it yet, but the Envaya Mini is probably the first speaker that small, which really manages some kind of decent stereo separation. On many recordings you will get the impression as if some instruments were coming beyond the speaker edges. The effect is not as pronounced as "Liveaudio" from the Jambox, but it is completely artefact-free, while Liveaudio only sounds good when listened exactly on-axis, otherwise it becomes quite weird. There is some additional DSP processing going on here for sure, it just doesn't sound that clumsy as all the other simple phase-shifting algorithms I have heard before. It depends a lot on positioning and distance from the speaker, I found around 1.5m to be the sweet-spot for the effect to become noticeable, and it will also work when the speaker is not aimed directly at the listener, sometimes I even found it to sound better when the speaker was offset or turned away slightly just some degrees. Some recordings will really sound huge and broad when played through the Envaya Mini. Some can give you the impression as if the instruments were floating inside the room. 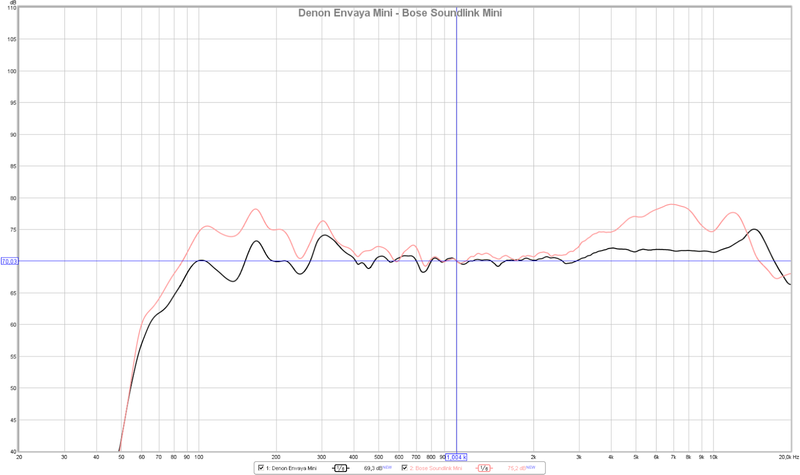 This is probably the reason, why the Envaya Mini is longer than most other speakers. The drivers are placed quite close to the speaker edges to allow better stereo separation together with the alleged stereo broadening algorithm which seems to add to the effect, the speaker really does a great job to offer some stronger stereo width. I've heard various different stereo algorithms, from the simple phase-shifting stuff up to more sophisticated crosstalk cancellation filters like "Liveaudio" from the Jambox. The algorithms used by Denon (I assume something from Maxxaudio) are really decent to that degree that you won't notice any negative impact, while the positive effect is easily noticeable. I am not quite sure what kind of "magic" is going on here, but it definitely works. It is just a pleasure to listen to. A Bose Soundlink Colour will resemble more of a mono kitchen radio if placed against the Denon Envaya. Although the JBL Charge 2 sounds considerably better than the Soundlink Colour (if we forget about the sound processing artefacts for a minute), but if you listen to both JBL and Denon, the Denon will give you that depth and width to the sound, that is totally missing from the JBL. 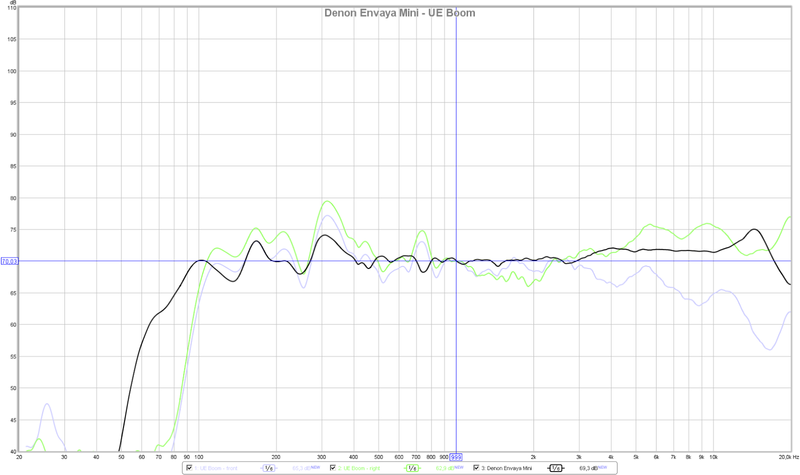 The Infinity One manages slightly better stereo imaging, but is still not quite close to the Denon Envaya Mini. If we recall that the Enaya Mini has just 2 drivers and a single passive radiator inside, one has to wonder how they managed to squeeze out that amount of sound. The DSP as such seems to be quite sophisticated, but apart from the main DSP acting as control center, the Envaya Mini has some additional sound enhancing algorithms included to improve bass response, increase stereo width and extend treble response. The bass you will hear is not all "real bass". I am pretty sure that the drivers have their limit at around 80hz, but on the Envaya Mini you will even hear much deeper notes. The idea behind this is based on a psychoacoustic effect called "missing fundamental". The algorithm (most likely Maxxbass) is adding virtual pitches to the original signal which fools the brain of hearing a deeper note which in reality is not present. This seems to work pretty well on the Envaya Mini as I could indeed hear deeper notes on some particular recordings that are usually missing when played through many other similar speakers, although according to the measurements their bass response should reach even deeper than that of the Envaya Mini. Demanding ears might probably hear some side-effects of this as bass reproduction is not 100% clean and the punch of the fundamental is missing. You'll hear the tone or are rather fooled of hearing it, but the real punch you would usually get from the fundamental is just not there compared to other speakers that really manage to play that deep. It is still a very impressive result what Denon achieved here, the same goes for the stereo widening algorithm and the treble enhancer which work together pretty well and manage to sound convincing without being noticed as some "fake"-effects. 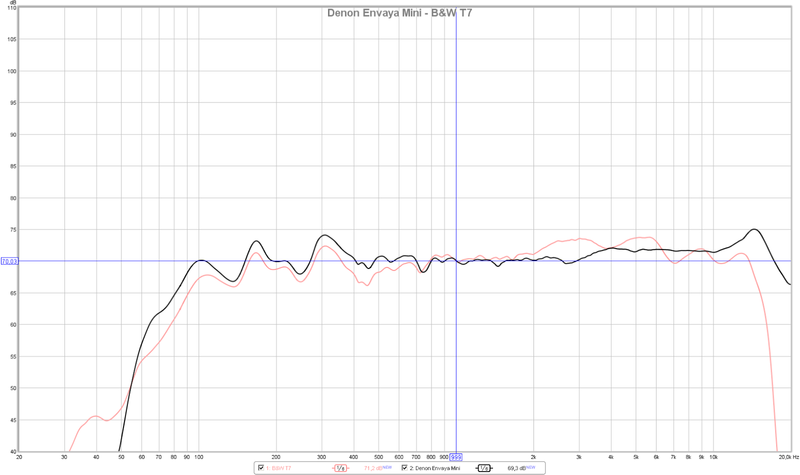 In contrast to many other speakers the DSP inside the Envaya Mini seems to be completely dynamic. As we already know the Denon Envaya Mini doesn't have mirrored volume control, which means you can control volume from both the speaker and from your streaming device. Doing so with any Bose speaker or especially with the Sony SRS-X3 and even JBL Charge 2 will result in strange changes in sound, depending if you max out the speaker or max out the player gain. Keeping the speaker volume close to maximum while keeping the player low, will make many other speakers sound strange as the dynamic sound adjustments are not dynamic at all, but rather seem to be bond to the actual volume step. The speakers expect high loudness and will turn down bass instead, although in reality the loudness is still low, because the player-volume is kept to the minimum. On the Envaya Mini the DSP doesn't care what gain it gets in, because the DSP seems to analyse the input-signal in real-time and adjusts bass-amount according to the estimated loudness level, thus the Envaya Mini will sound exactly the same if you turn it up to maximum while keeping the player-volume down and vice versa. You could indeed leave the Envaya Mini just at the highest possible volume step and then adjust the volume directly from the player but as we have seen this has a huge negative impact on battery life, therefore it would have been favorable if they had implemented synced volume control between speaker and player to get the best out of the Envaya Mini. I guess the DSP forces the drivers to their maximum possible excurison all the time before reaching distortion. This way they manage to make the sound full-bodied at low levels while still keeping control of everything at highest level. I only noticed some slight rattling from the passive radiator with really heavy mastered stuff. 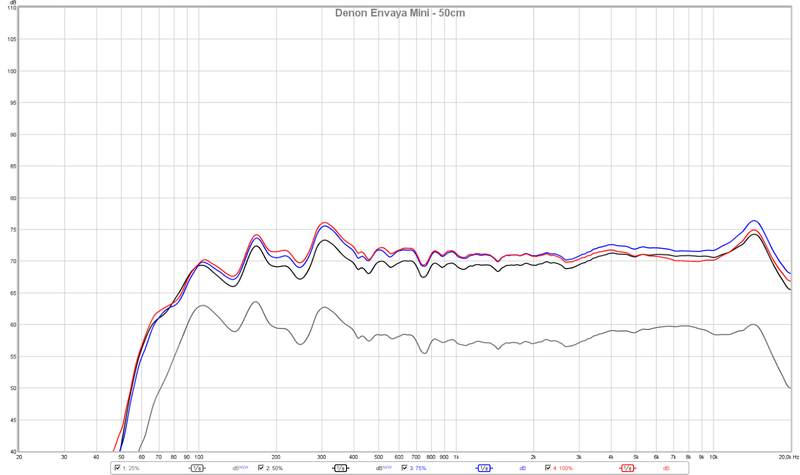 I did not manage to make the Denon Envaya Mini distort at all with most of my usual test-tracks which left me quite impressed. Other speakers start appying noticeable compression or overall volume starts to fluctuate depending on the amount of bass, not so with the Envaya Mini, as it won't give you the impression it is reaching its limits. I was curious to see where the limits really were and listened a lot. One thing I noticed was that you might get some scratching or crackling if you increase volume on the speaker quickly when some music is playing. Obviously the DSP lags slightly behing the set volume level which might result in some short distortion. Another thing I noticed was that if the speaker was set to exactly 60% the DSP seemed to overshoot the mark because some slight distortion started to appear here as well although it went away again if you increased or lowered volume 1-2 notches. This is a very narrow volume-range where the sound can start sounding clipped and usually you will really have to seek this particular level, as it is only 2-3 steps wide where those problems might occur, therefore I won't call it problems at all, unlike the Beoplay A2, which suffered from considerable distortion through the whole upper half of its volume range. Sometimes the Envaya Mini also seemed to swallow some beats of particular tracks, especially the first 10 seconds of a track were affected. I am not sure if really the speaker is to blame, or the iPhone or whatever, but this never happened with any other speaker so far. It was really weird, but it seemed as if the DSP was getting confused by some new unexpected content in the music. For example when a song started only with a piano sound, the speaker started cutting off some notes as soon as the drums kicked in later on. I tried playing the same tracks through many different speakers but only the Denon repeatedly didn't manage to play those tracks without hiccups, just when I reset the speaker by pressing the play and battery button at the same time, the song was finally played fine. Of course the Envaya Mini cannot compete in both bass response nor overall loudness of the Play:1, but ignoring the differences in bass, sometimes it is hard to tell which one is actually playing, both play tonally on a pretty high level with a very natural response. 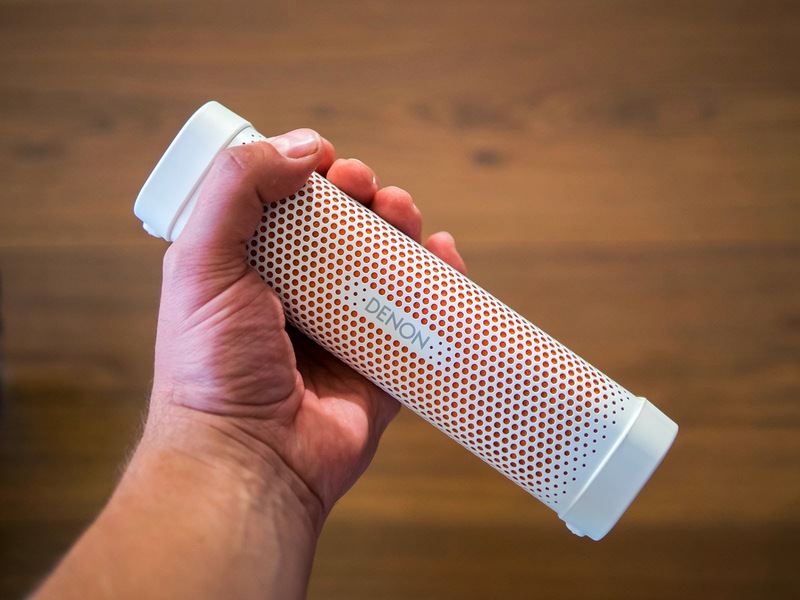 The Infinity One might be currently one of the best sounding portable speakers available. It is around 3 times larger and much heavier but the Denon Envaya Mini holds up pretty well with what I would call more natural sound than the Infinity One, albeit missing the deeper bass punch of the Infinity One. But when just looking at the difference in size and price, it is hard not to remain impressed by the Denon. The same goes for the JBL Charge 2, which manages a punchier bass although with some really strong distortion on the bass-drum. I still wonder how the engineers could overlook such a flaw. What kind of music do they use for testing, or do they just play pink-noise whole the time? We can also have a look at some frequency response measurements. Let's start with an in-room response from 50cm at different loudness levels. As you can see from the measurements there is hardly any increase in output above 50% volume which is just humbug because the speaker can play much louder, but it seems as if the DSP was preventing any louder output if fed with some sine-sweeps only (smoothed with 1/6 octave). The Denon Envaya Mini left me quite impressed indeed. Regardless what I was trying to play through it, it sounded great at any volume level. I think the Envaya Mini is currently by far the best compromise between sound and size if you want to stay as compact as possible with the best sound possible. There are definitely similar speakers with more bass, but they just don't sound that good overall lacking in either treble response, or fighting with other issues. 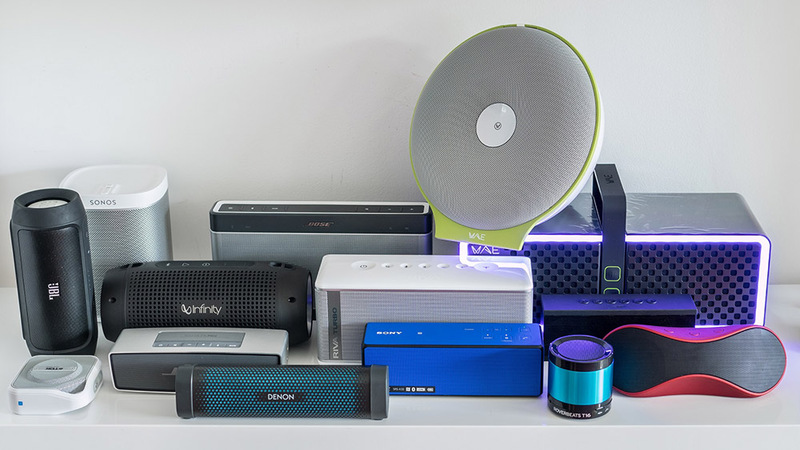 When hearing the Denon Envaya Mini it finally led me to the decision to sell all the other junk I was owning, including JBL Charge 2, Sony SRS-X3, Fugoo, Mini Jambox, FoxL DASH7 etc.as the Envaya Mini does nearly everything better than the others while still being perfectly portable. It is larger than a Mini Jambox or other smaller pocketable speakers, but it produces such a better sound, that I am willing to bear the extra bulk and weight. Just be prepared to charge it every 5-6 hours if you really like it louder, as the battery seems to be the only weakness of this otherwise close to perfect speaker. 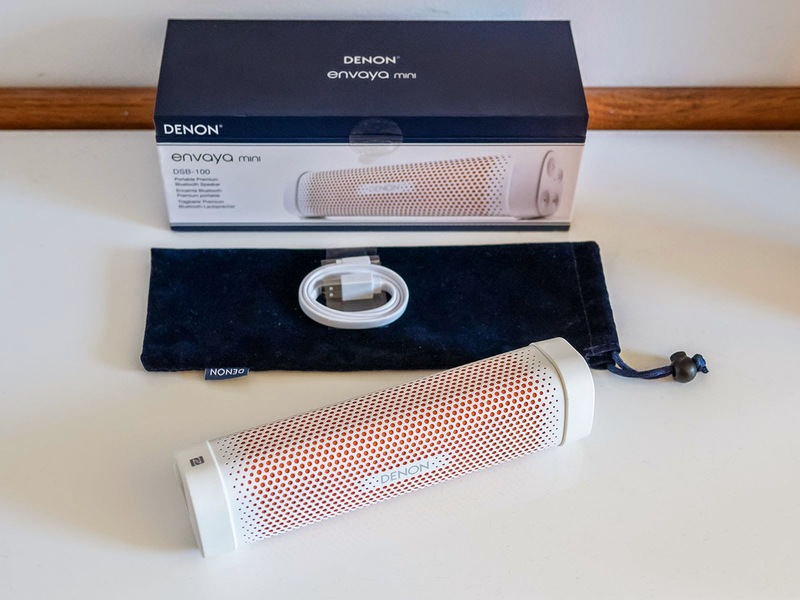 The Denon Envaya Mini is definitely my current reference for any portable speaker below 100€ sized that small, although it can also easily outperform much larger speakers, albeit without reaching their loudness of course. If you really need more loudness or more power you will probably still need another speaker, in my case it's the Infinity One, but for everyday usage I meanwhile even prefer the Denon, as it sounds pretty close to the Infinity One with slightly less bass but a more natural overall sound. I have yet to hear a better sounding speaker that small, let alone one that is able to offer some real stereo separation. Denon really raised the bar with this one, offering it much lower than most competition makes the other speakers look and sound pretty bad now. 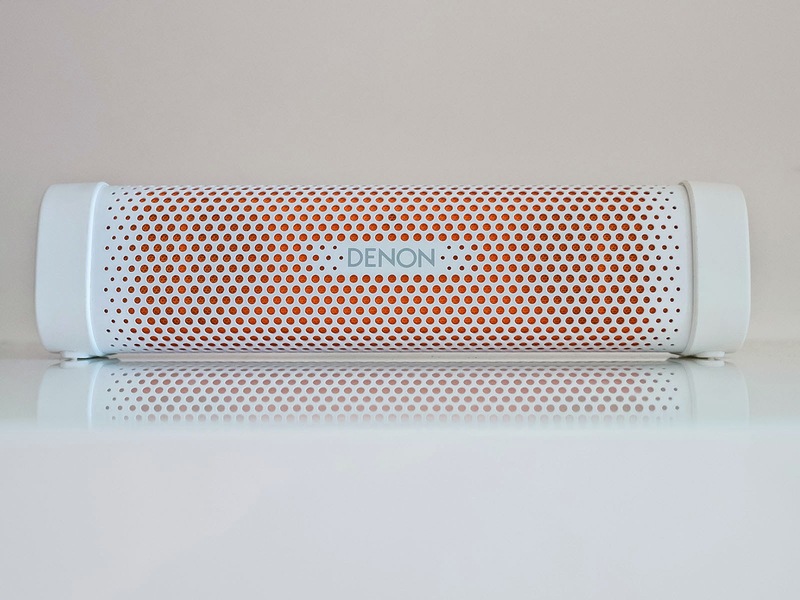 The Denon Envaya Mini is to the whole Bluetooth speaker market what the Sonos Play:1 is to the stationary wireless speaker market and earns my highest recommendation for anyone being serious about music to be taken with you! I was almost convinced to buy Bose Soundlink Colour. Now I have chanced my mind due to your review and go for Denon Envaya Mini. Why no sounds comparison to the Soundlink Mini? You talk a lot about it, but don't compare it like the others. Hey Oluv! Merry christmas! Thanks for the review, I got my black and blue Denon Envaya Mini for christmas, super happy with the sound, it's really amazing! I noticed a little thing though : When I turn on my Envaya Mini, and when I put my ear very close to it, like at 10cm, I can notice a very little wind noise. It's very slight, but I wanted to know if you noticed the same thing? Usually I don't hear it at all, it must be really silent in the room, but mostly either the computer fan or something else is drowning it away. Thanks for the answer. It's my first bluetooth speaker, so I didn't know if it was normal or not for the Envaya like a bad batch, or if you had the same "problem" with other products. To be fair I can only notice this very slight wind noise when I put my ear at like 3 centimeters and not 10 in a silent room, otherwise I confirm it's just impossible to notice! Habe mir das Wunderding bestellt. und wie macht sich der kleine gegen den grossen? Now I am sitting in from of the Denon Mini and I am just delighted. This is indeed the speaker I was looking for. Especially for my use case (backround music,low to medium volumes) this is just the perfect device. Well, the battery life is probably not outstanding but fine for me. At the volume levels where I mostly consume it (max. 50%) I experienced about 8 hours until the flashing red light. Neutral frequency response speakers are just the most relaxing onces to listen to. Even without a lot of technical measures you experience with the Denon mini the never ending desire to continue to listen to it. I have a small son like you. This means the joy of listening to loud music from my nearly perfect highend HIFI system is very limited. With the Denon mini I have HIFI with me, wherever I go now. I feel like kid who has found a new treasure. Looking even forward to my next business trip and some 'music rich' hotel nights away from the family ;-) ... Thanks for pointing these Denon qualities out ! Thanks for sharing ! keep on the good work. Happy, healthy and good 2015 for you and your family ! This new speaker looks good. Curious to know if you ever tested the microphone? Would like to get a speaker that I can use for calls. Which would be a better choice, the Fugoo or Envaya mini? I am not Oluv but I've my envaya since christmas, and I used the envaya microphone for 2 calls, each time I was like at 50 centimeters from the speaker and nothing to complain. Maybe Oluv can confirm that, but the person I was talking with didn't complain about the quality. Well, I got the Fugoo, unfortunately its not working with my Galaxy Note 4 when it comes to calls. Still trying to fix this with Fugoo support, but no luck yet. Not sure if anyone else has this issue? Wow, Oluv. I am glad I stumbled onto your site. The Denon DSB100 does not seem to be available yet in Canada, so hopefully I will be able to get one when it comes out. Great reviews btw. I only started to research these sound boxes, because I happened to hear the BOSE Soundlink Mini in the store a couple of days ago and I was almost left speechless. Because I am someone that does not buy on impulse, I decided to research before spending money. So I've decided to take your advice and buy this Denon Envaya Mini. Looking forward to it because it fits my needs: low-level and mid-level listening. I especially like low level listening to be spectacular and your review seems to point to this. Great review, really helped me a lot. I got myself Denon Envaya Mini - and I'm really surprised how good it sounds. Cool thing about Envaya mini is, that you can still listen to music while charging your speaker. Is it safe to turn volume max? well it's pretty obvious from the videos that there is a significant compression in max volume....so I guess DENON designers have taken care of that,throught the DSP 's 'safety belt'.Apart from that battery is draining faster so overheating is not getting dangerous! I would rather say they are 2 different pairs of shoes, with the Negaboom costing 3 times as much. But I am curious too hearing it in person. I'll be very interesting when you can compare it to other BT speakers. The recommended price seems way too high, I hope it'll be about 200-250 Euro after a short while. Unfortunately it won't turn on on its own and in Bluetooth mode it will turn off after 15 minutes if no music is being played. But there might be a work around because in aux-mode it will turn off after 8 hours but you can deactivate this completely. So as long as an aux-wire is attached and the auto power off is deactivated it should stay on while the time. Bluetooth should still be active even with an aux wire attached so you might be able to use it that way permanently. You will probably have to manually reconnect to it if you left the house with your phone and came back home as the Envaya mini won't probably reconnect automatically on its own. Why not using a Harman Kardon Omni 10 for such a task it has Bluetooth too. I'll have a look into that. What I'd really love is a high quality compact speaker which has both Bluetooth and Apple Airplay but there doesn't seem to be anything suitable on the market at the moment. If HK, Denon, Bose or B&W made one I'd be on it like a shot. Airplay is not very practical for portable use as it needs much more power than Bluetooth. I am not a big fan of Airplay except as stationary solution at home. The Sony SRS-X7 has both Airplay and Bluetooth, Libratone Zipp was also updated to Bluetooth, and the Harman Kardon Onyx has both Airplay and Bluetooth on board, but they are all larger and more expensive. I've been waiting for this speaker since reading Oluv's and others' reviews. So far it still doesn't seem to available in the US though. Does anybody have any information about US release by any chance? Any information will be greatly appreciated. You can get it at audiogurus.com for US $149. Audio gurus.com has horrible reseller ratings. 5.5 out of 10 stars. I'm still waiting for a legitimate retailer in the U.S. I also decided to skip over audiogurus.com because of their reputation and especially their long battle with audioholics.com (a site that has only been honest and helpful since its inception). Thank your for the answer. I looked at audiogurus and it is a pre-order at this point. They say it will be available at the end of January. I'll wait and see if, once it does actually become available, the real price will stay the same. Prefer to buy from amazon anyway. Thanks again. Got mine yesterday. Played with it for about an hour and left it to charge. Today morning doesn't turn on at all. No light no sound, just dead. Quite sad cos the sound produced from this speaker is very good albeit the lake of a tiny bit of bass, specially when you're not near to it (3m away). Also I've noticed a deterioration of sound and severe distortion at half volume when streaming music from Spotify, something my other cheapo Creative BT speaker doesn't do, although it played fine from my own Phone library. And you are right, this thing can't keep its feet on the ground when playing loud, you must put something underneath it (e.g speakers own carrying bag) to keep it in place and sometimes the vibration it self is creating some distortion and sound quality deterioration. Stereo is much more noticeable than other BT speakers I tested at stores. But only when you are very close to it. A mere meter away and you are on mono mode again. So don't expect a Full Blown HIFI Stereo Speakers effect if this is what you want. Maybe I've got a bad copy. But this is the first time ever in my life getting a DOA (or DAA - Dead After Arrival) product, making me thinking about alternatives like Sony or JBL (definitely not Bose). No light from any side. Even when usb is attached. I used a 2A charger of my Samsung Note 10 tablet and Note 2 phone. The light was blinking when I left it charging yesterday. And now trying its own USB cable with another 2A wall adapter and no light at all. Funny enough, this was the last item found in the entire Finland. If I return it for change, I'll have to wait quite long for a replacement. After the swap, now my new lil denon works great. I use it as a computer sound bar as I don't have much desk space for two monitors, documents folders and two decent stereo speakers. The denon also will double as travel and picnic speaker. The sound is very good as I mentioned before. It's not as loud as other BT speakers but it does the job fabulously considering it's minimalistic size. And it's almost half the price of e.g Bose soundlink mini and IMO the denon sounds much better. I was going for the Sony speaker until I bumped on your detailed reviews about many other speakers, you are practically a BT speaker'pedia! and for that I thank you so much for the effort. Have a great time enjoying your music! Did you end up finding out what was wrong? My Denon has done the exact same thing. I'm in Australia and currently waiting on Denon to email back in regards to repair or replacing the unit. Hi Oluv, would you definitely recommend DSB mini over Jbl Charge 2? I am a bit hesitant right now, cuz i was ready to buy jbl and then i stumbled to this review..Do you still think that JBL is much louder? or the difference is negligible? Sound quality is definitely Denons advantage but my only concern is the overall loudness..i dont have other speakers in my appartment and i plan on using this as a primary speaker (appartment is quite small - 22 sq ft)..so i am not sure what would be the best option between those two..
if "room-filling" is your main concern I would go for the JBL as it is slightly louder and keeps more bass at max. volume. But both speakers are not very loud at all. A TDK A33 will be louder and sound better at comparable levels, but it is bigger as well. Thank you very much! Is there any chance i can guess if i am buying a new unit of jbl c 2 - without distortion? Are there any serial numbers or signs that can help us say if thats the old or new version of jbl? unfortunately none that I know, it was just per chance that some guys discovered that the "refurbished" units sold directly through the JBL outlet had no distortion, meanwhile I also ordered such a unit and the distortion has gone. but only JBL knows which serial numbers have problems or not, they won't confess I am afraid as they still seem to pretend not having any problems at all. Oluv, I really appreciate the time and effort put into your reviews, but there is one category that is lacking in most bt speaker reviews; audio syncing with video. 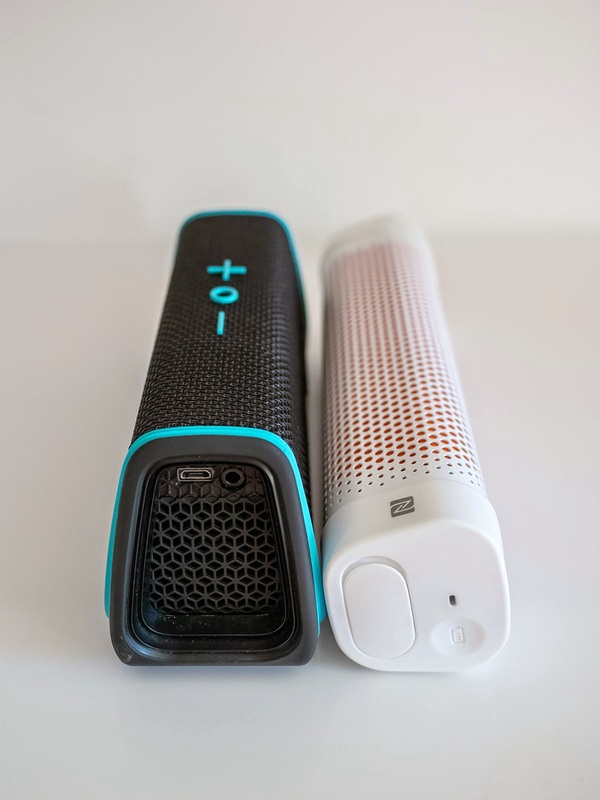 For example, the UE Boom and Megaboom both seem to lag when watching streaming video from YouTube or popcorn time and sometimes Netflix. So sometimes it will look like you're watching a dubbed film. Bose Soundlink iii and mini do not have this problem. Could you see how it is on the Denon? It's a test I do when auditioning all my bluetooth speakers, as I use them for movie enjoyment as well with my MacBook Pro. All Bluetoothspeakers have some slight delay, the Denon has low-latency AptX so if your device supports this you won't have any delay at all. do you think about compare Denon Envaya mini and Philips BR-1X ? I saw and heard your video but you did not express your opinion. Also, what do you think of Altec Lansing LifeJacket? I love your test and review. I saw all your youtube video. I think it was clear, the video was just because someone claimed the Philips to sound much better than the Denon, so I wanted to prove for myself. The Philips is louder for sure, but at a similar price the sound quality just cannot compete with the Denon. It is a strange honky sound and I would avoid "outdoor mode" which sounds really shrill. Do you know Altec Lansing LifeJacket? no, haven't heard the LifeJacket yet, doesn't seem to be that popular in Europe, although there are some retailers who sell it. In your opinion, what would be the best speaker for use in the car? Which speaker bluetooth can give an immersive sound and little directional? Although if it is less loud but it must have immersive sound. not sure where you are going to place it. most speakers don't sound good against the windshield because of the upper bass resonance, they sound better at the passenger's seat or even in the leg area. it is not easy to find a good one as it must be loud to overcome the noise and have enough bass to sound convincing. the TDK A33 might be a good choice and you might be able to charge it through the 12v output. One question, how do you know which volume step you are on? Trying to conserve battery power. Or does volume step not matter, only actual sound output volume? it has 100 steps, just press + 50 times to have half volume. i am not sure if it really has an influence on battery turning the speaker to the maximum and lower volume on your player instead, or doing the opposite, but the result is the same when looking at sound only. i haven't tested it yet to tell the truth. I've got the Fugoo and the Denon, both are pretty good for me. For music, the Denon sounds better. I find I prefer to use the Fugoo for movies as the voices are clearer. 1 annoying thing about the Denon is that I have to adjust volumes on both the speaker and the phone depending on whether I answer a call or just listening to music. Not sure if anyone else is facing this? I paired it with Denon with max volume on the phone, once I've adjusted speaker volume to similar level for music, when I answer a call, the call volume is actually quite soft and I find I have to lower down the phone volume and raise the speaker volume to make it louder. Once I reconnect my phone to the car or Fugoo, I have to readjust the phone volume to max again. Hi, I can't reach more than 6 hours on my envaya mini ( volume max 50% ) How did you test the battery life? Bluetooth or wire connection? Bluetooth connection, Denon Envaya Mini exactly at volume step 50 (out from 100), iPhone at max volume and letting a playlist of "Fourplay" play until it turned off automatically. The first unit I got reached 8:40. But there seems some sample variation as the next unit I tried reached only 7 hours. Yes my battery life doesn't feel like 8+ hours either. Although I have not performed a full end-to-end test, it usually lasts me about 1 week with moderate listening (approx 30-45mins a day). Thats not terrible, but I expected a little better. I think I'll need to make sure it is at step 50 and adjust volume from device and then test from there. I got both the white and black model. The white one usually lasts about 4-5 hours, while the black can go about 6-7 hours. Not sure if it's a problem with the battery, the white one runs pretty warm. Oluv, thanx for your video and review! But I have one question. Please, tell me whether this wireless speaker constantly be connected to an electrical outlet that batteries are not discharged? or it is the same problem as with the Sony X3? when it Sony, or a battery runs or can only be charged. Just wanted to thank you for the great review of the mini. Went and bought one yesterday (in India) and I was completely blown.. I think there is some serious voodoo behind the stereo separation. I've got my Envaya mini 3 weeks ago and I've notice that when it is fully charged and I'm not using it for 3 days, the battery drains to the point that I can't turn on the speaker. I have to charge it to work again. Do you have the same problem? Or anyone who is reading this? I know that the speaker has it's own power consumption (in power off mode it is 3mW) but I didn't think that it is that fast. Beside this, speaker is great. No, I haven't noticed this yet at least not to such a degree, but I will test this the next time and let the speaker unused for some days. Let me know what are your results. And thank you in advance. So far I couldn't find any self-discharging with mine. I charged it full on Sunday night, deattached it and let it unused until today, which is nearly 4 days and it turned on normally with the battery still showing green. But a friend of mine also noticed some self discharging with his. Maybe the speaker jumps into some "protection" mode after some time? Similar to what Bose is doing when the speaker is not used for some time. Not quite sure! What do you mean with: speaker jumps into protection mode? If your doesn't have this self-discharging flaw, that means that mine is defective so I will send it back and ask for new one. 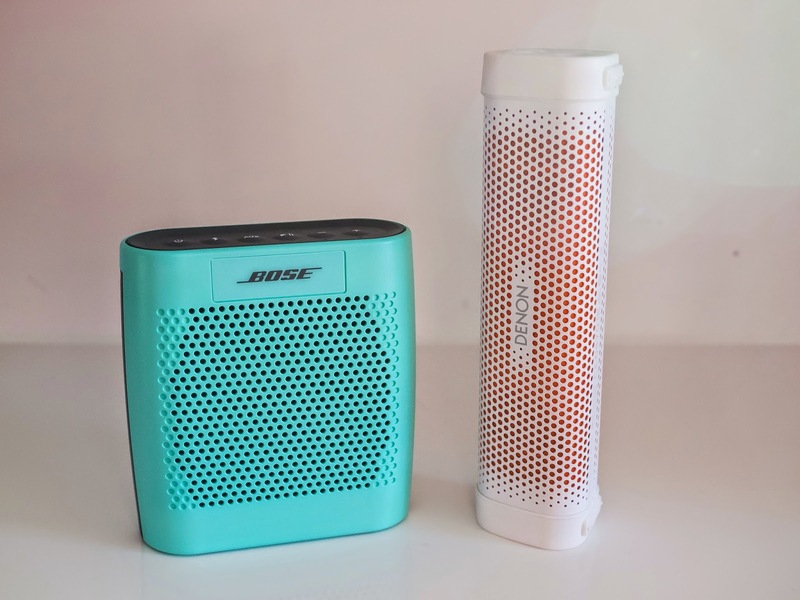 Bose has a special protection mode on their portable speakers which becomes active if they are not used for a particular time, I cannot remember how long, but i think 7-14 days without usage and this mode becomes active. You won't be able to turn the speaker on after that time, you will have to reset it or attach it to mains. When I got my brand new Envaya Mini it didn't turn on either, I had to attach it first, but according to the LED which was blinking orange there was definitely some pre-charge, thus the speaker should have turned on, which it didn't, therefore I assumed Denon also has a similar mode. Question: If the Denon runs out of battery, can we just plug the charger in and listen, or does it need to be charged for a while first?? I just want to use it in the kitchen, and leave it plugged in all the time. Yes, it can be run from the charger after the battery goes flat - a very good feature which Bose MiniLink has not for instance (that was one of the reasons I returned my Bose). Sony XRS-X3r (as well as x2) can be also run through a charger. Yes, I have the same problem with discharging over time. I am not using Envaya too often but it really pisses me off when I need it after a week and the speaker has no power available at all. Moreover, if you plug in the USB charger, you get can't use it immediatelly anyway as it will start turning off after few seconds you turn it on. You have to wait till the speaker is at least partially charged. And while being charged, be prepared to hear noise from the speaker. If I knew that before, I would not buy (although othervise the speaker itself sounds good). Does anybody knows how to avoid this enormous self discharge? 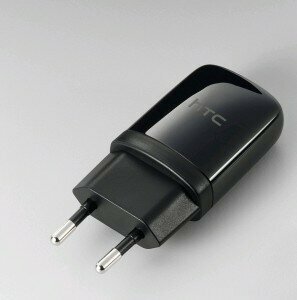 I can understand the device will completely discharge in a month or twoo. But in a week? These Denon engineers must be joking me. Same here, battery usually ends up almost flat if you don't use it in a week. On top of that, what I experienced is that if I use the aux-in while charging it ends up with really bad interference. No issue if you charge and play with Bluetooth. Hi, Oluv! After reading your thorough review, I opted for one of these speakers, so far I am very happy with it, thanks for all the effort put into this writing. I currently have only one concern/doubt. Do you know if it is ok for me to use it keeping it on the AC charger all the time? I am not sure if it smart enough to use directly the AC power or if would use the battery, constantly recharging it - which could be bad, I'd guess. Thank you very much for these tests. This made my decision for ohne speaker - the Denon envaya mini! And in fact: It sounds as described and it sounds really better than the other speakers for this price. I think, your tests and your analyses saved me a lot of money! Kind regards and thnks a lot! Hi Oluv, I used to own a Bose Soundlink Mini after watching your videos on YouTube, and immediately switched to Denon Envaya Mini last week (it only became available here in South Korea 1st week of February) since I saw your reviews sometime around Christmas. I am surprised how powerful and amazing this speaker is. I was almost decided in replacing my soundlink mini with a JBL Charge 2, glad I read all your comments/replies both here and at YouTube. All my doubts in selling my Bose were gone and my BF was excited to get his own Envaya Mini that he was wishing the long holidays due to Lunar New Year celebration can be fast-forwarded. Got myself a white one, and BF bought black, and although I still think white is better, I was slightly disappointed to find out that the edges of the speakers (rubber/poly finish) got stained blue, when I put them on the pouch included in the package. Also, the manual says the battery would last up to 10 hours, but ours seem to last for barely 4-5 hours, at 50% volume on both the speaker and the paired phone/music player. You think this is normal? Please enlighten me on the battery life, since I haven't seen a review available locally, apart from the advertising and marketing blogs from Denon KR. Hi J! you should get 10 hours with average loud recorded music at around 40% of the Envaya Mini's loudness scale? How did you measure 50%? The Envaya Mini has 100 steps, you should set your player to maximum and if the speaker is set to step 40, and you should get 9-10 hours. i got 8:40 at step 50, of course the battery life will go down pretty quickly the higher you set it. I got barely 3 hours at maximum volume with mine. Of course it depends on music content as well, very loud and very bass heavy music will drain the battery more than soft acoustic recordings. I think my previous post got lost... Yesterday I got my Envaya Mini, really impressed with the sound quality, the volume is enough for my use and all kinds of music sounds extremely well through it (I listen mostly to pop, rock, hard rock and metal). I noticed a low "white noise" when not playing music, but it's very low and slightly noticeable even in a silent room; this noise turns into a higher pitched hiss when you turn the envaya volume really low (say the first 5 levels). Is that normal? I think it's some digital garbage due to the low volume. Anyway I'm really satisfied, and thank you for not letting me buy the UE Boom :D This Envaya really surprised me for it's well balanced sound, tight, not too boomy bass and good definition! i must confess that I haven't noticed any disturbing hiss with my Envaya Mini. 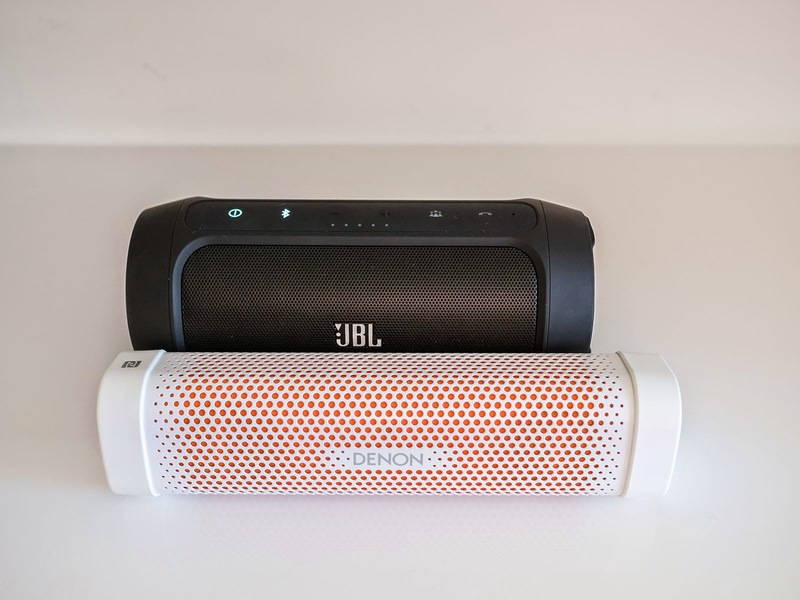 there is of course some slight noise when i put my ear close to the speaker, but the JBL Charge 2 is much louder in this regard, not to mention other speakers like the Soundblaster Roar which you will hear from more than 1 meter easily. you are connected to some device per bluetooth and does the device play something or is it just mute? after turning down volume on the speaker completely you get another harsh sound instead of complete silence? Well it is not really an issue, it was almost not audible now in a "normal" environment. Anyway the hiss and the noise are presents even when pressing the (-) button, so the device is never completely "muted". And having or not having a device connected doesn't change it. I also got, as in your review, some strange hiccups at the beginning of some songs, did resetting the unit fix that "forever" or the issue got back on? no resetting it did not fix it forever just for some songs. i am also not quite sure as it doesn't happen with all songs. 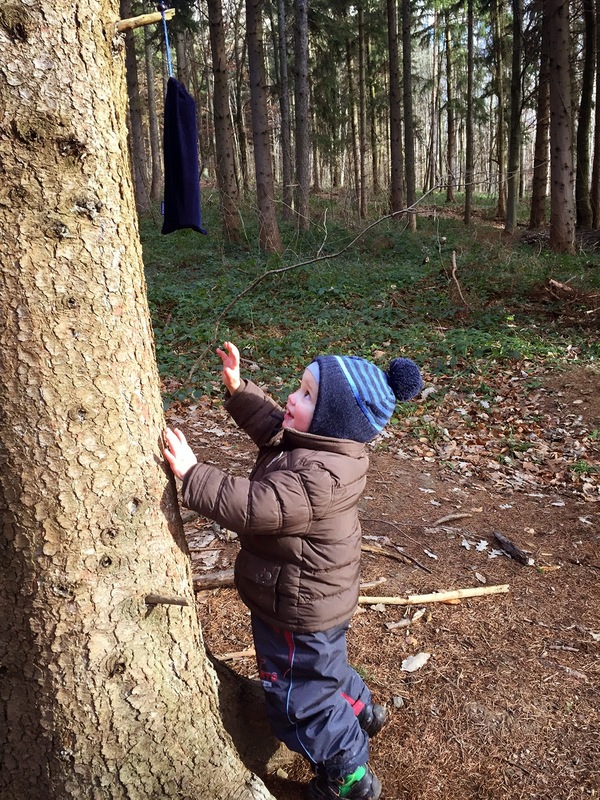 some play fine all the time, while others always seem to cause problems. if this happens i often skip to the previous song and then scroll to the end, so that the next song one will start automatically after the previous one has finished. this way no skipping occurs. strange, but i can live with that. please let me know if you have some news. i rather think it is related to song-content. i use the envaya mini from an iphone which has no apt-x support and it occurs in the same way, so not quite related to low-latency i guess. i think it has to do with maxxaudio processing. either maxxbass or maxxtreble probably cause the problem, the processor cannot keep up with some music content that is unexpected. i have some funny songs which start just with a piano, everything ok, then when drums kick in, it starts skipping. this does not happen at the very beginning, but the song already run for 20 seconds or more, and it always happens at the same point, which leads me to the conclusion that it might be some processing issue. Hey, after some months of use I'm still happy with my Envaya. I didn't notice the hiccups anymore, maybe I just got accustomed to it or maybe the iOS updates solved the problem! Recently the price of the Envaya Mini (the black/blue version) is very high. The italian version of amazon sold it at 89,90 euros (the white version) and 94,00 euros (the black/blue version) some time ago. I hope it gets back to a price around 90,00 euros (the black/blue version I like most) in the future. I remember you bought it at 79,00 euros (the white/red one). maybe denon got surprised about the popularity and are now trying to sell it for more? or they cannot fullfill the demand and the price goes up on its own? Michele, Envaya is back to low price on Amazon, if it's not available just look for it from "Amazon" (not from other more expensive retailers) and place your order for the low price, as soon as they have it in stock they will ship it. I did the same with mine and took three or four days to be available. I just ordered it from Amazon (US) and it was $149 (134 Euros) And it says 1 to 4 month wait time. I guess there is a lot of demand for this these, probably because of Oluv! It's still $30 less than the Bose Mini. Looking forward to it! Do You think this one has a 7,4V battery? I knew there had to be some savings made. I hope it is at least the highest possible quality for an old technology so the battery will be of any use after 2 years. BTW how did You know that? I couldn't find any info on google. You claim that this Envaya is the most loved by You but under the linked video You also state that the Sony X3 is a little more bassy and better (?) at lower volumes? It also has a 7,4V battery which probably produces more dynamic sound. So what is Your favorite as for today? the sony is not better, the denon sounds more natural and stays clean at any volume level, the sony distorts with bassheavy music. the sony battery was not impressive either, after 2 hours of playback at maximum volume it automatically reduced volume to half. Awesome speaker - awesome review. I've owned NudeAudio Super M (very unimpressive) - Charge 2 (great for bass but flawed) - and now this - it is tiny and almost perfect - buy for sure. I was considering other speakers, but I'm glad I came across this review. I was looking for a speaker which had good overall sound quality rather than being able to go really loud, so I bought the Envaya mini and it doesn't disappoint! Especially concidering the price compared to some others. Paolo your name tells me you are Italian. May I write the replay in Italian? The white version was sold at 79,00 euros. On amazon Italia it was sold at 89,00 euros till one month ago. The blue version (which I prefer) was sold at 94,00 euros till one month ago. The blue version is now at 111,50 euros. I hope it returns to be sold at 94,00 euros very soon. In the meanwhile I don' t think I can reserve it on amazon till it reaches the price of 94,00 euros. I saw this possibility on amazon on other occasions; but (maybe I'm wrong) this time it's not possible. Or it's always possible Paolo? Wow completely missed your post and now two months passed, I'm so sorry. Anyway yes I'm Italian but let's speak english for the sake of non-italian audience :) When I bought mine I was able to reserve the low price because the item was listed with the low price but "not available", so if you reserve it they can't then increase the price on your order. Can you use the phones (iPhone) EQ over bluetooth with the Envaya Mini? Thanks for the review! The software EQ on the phone modifies the sound _before_ it's sent out via Bluetooth, so of course you can. Vielen, vielen Dank für diesen ausfühlichen Test und die Vergleiche auf Youtube. Nachdem ich mir den Envaya und den Charge 2 zum finalen Vergleich nach Hause geholt habe, ist es der Envaya geworden. Die einzige wirkliche Schwäche (der Akku) lässt sich ja leicht mit portablen USB Akkus ausgleichen. Noch mal vielen Dank. Es macht Freude, diese mit Leidenschaft geschriebenen und gefilmten Einschätzungen und Vergleiche durchzugehen. Gut, eine solch ansprechende Adresse für dieses Thema gefunden zu haben!! Hallo Arne, erstmal vielen Dank für die Spende, hatte einiges um die Ohren zuletzt und war auch krank die letzten Tage deshalb die späte Rückmeldung. Natürlich ist der Denon mit einigen Stücken nicht mehr ganz sauber aber er ist dennoch viel beherrschter als der Bose beispielsweise der kläglich dahinwummert wenn es mal etwas deftiger wird. Ich hab mir dein besagtes Stück natürlich gleich mal angehört so bei etwas über halber Lautstärke ist mir aber nichts aufgefallen. Wie laut hattest du da eigentlich gehört? Mir ist auch aufgefallen dass wenn der Denon ab und zu mal verzerrt es oft reicht die Lautstärke direkt am Lautsprecher 1-2 Stufen rauf oder runterzusetzen dann wird es meist wieder sauber. Gern geschehen! Ich weiß die viele Mühe sehr zu schätzen und habe mich auch über den Kommentar bei meiner Amazon Rezension des Charge 2 gefreut. Das Lied hatte ich während meines Ausprobierens mit dem Charge 2 bei niedrigeren bis mittleren Lautstärken gehört. Der Envaya war maximal auf Stufe 50, der Zuspieler auf verschiedenen Niveaus bis maximal. Der Effekt war über mehrere Stufen am Envaya selbst zu hören (ich hatte mich an den Tipp erinnert, dass manchmal ein-zwei Stufen Verstellen einen großen Unterschied machen). Vielleicht hatte es einfach etwas damit zu tun, dass ich über Spotify gestreamt habe (müsste zu der Zeit auf mittlerer Qualität eingestellt gewesen sein; Zuspieler war ein Lumia 1520). Ich kann mir gut vorstellen, dass der DSP Prozessor einfach dann und wann Probleme mit der Kombination aus Abspielsoftware, verwendetem Bluetooth Protokoll (ist ja leider nicht direkt zu überprüfen; aber das Lumia beherrscht Bluetooth 4.0 und aptX) und den etwaigen Eigenheiten der Aufnahme an sich hat. Bisher hatte ich aber nie wieder so einen Effekt. Und es war wirklich grausig! Auf das Lied hinter dem Link bin ich gespannt. Ich werde nachher mal reinhören! Trotzdem, jedes Mal, wenn ich ihn wieder anschalte, bin ich begeistert von dem Teil! Quick tip - if you want to improve bass then position the envaya mini at a level above your head like on the top of a book shelf. Makes quite a bit of difference! Any corner or, to a lesser extent, any wall does it, too. The passive bass radiator is placed at the back of the Envaya Mini and having something to reflect its output makes quite a difference! Based on your reviews, I bought the Envaya Mini. I also have the Bose SoundLink Mini and the JBL Charge 2. Unfortunately my JBL has the distortion issue. Since I like to hear some speakers in person, I also bought the SoundLink Colour. Maybe this will be strange for you, but I like the sound of the SoundLink Colour the best. The Envaya Mini also sounds very good, and has much better stereo separation, but especially the singing voices are cleaner with the Colour - at least for my taste. While the Envaya Mini sounds great, it always gives me the feeling as if the singer was behind a curtain, or is singing through a thin blanket. I hope you understand what I mean. I know what you mean but the Denon is nevertheless more true to the original sound. Bose tend to emphasize particular frequencies to make their speakers sound better or pleasant or whatever, but the sound will always remain colored. You may like it or not, I never said the Soundlink Colour to be bad but I disliked the resonance with bass notes it produced, I listened to a lot of famiar recordings through it and it never sounded how I knew the songs should sound, listen to the kick drum of Michael Jackson's Billie Jean and you will know what I mean. Thanks, I listened to the song you suggested, and lots of others. Indeed, there are certain songs that don't sound good with the Soundlink Colour. So I took it back, and discovered that a new batch of JBL Charge 2s have arrived, with serial nr TLxxxx-LExxxx.. Originally I had one that starts with GG - GE that produced an annoying level of distortion with a lot of songs. Interestingly, all TL versions have much smoother, easier to press buttons. This also applies for the Flip 2s, that also have GG and TL versions. (two different factory perhaps?) From testing the display units I could tell, that even the TL - HE versions suffer a bit from some distortion. The TL - LE I bought is absolutely free from any strange artifacts and distortions. It seems that black is the most popular model, 'cause all other colors are still with older serials. The new version sounds completely different than the old one: more pronounced highs, dialed back mids. Hey Oluv, hab mir den Denon envaya mini in weiß gekauft, leider war kein Netzteil dabei. Kannst du mir eins empfehlen, am besten auch in weiß?! Ich kann das Inateck 20W 5V 1.5A/2.4A 2-Port USB Ladegerät empfehlen. Gibt es bei Amazon. In der Anleitung des Envaya wird empfohlen, bei 2,4A zu laden und das bietet dieses Ladegerät an einem der Ports. Ich bin bislang sehr zufrieden. Is there a difference in battery drain if you keep the Envaya on full volume all the time and use the phones volume compared to keeping phones signal at full and managing the volume on the Envaya? yes there is, and it is a bit unfortunate because you lose a lot of run time if you keep the Denon Envaya Mini maxed out. I already wanted to add this to my review, but I only just finished my exact measurings dealing with this topic. When the Envaya Mini is playing at step 50/100 is will play for 8:38 in my case. When the Envaya Mini is kept at maximum but the volume is reduced on the player to get exactly the same loudness as before, it played for 5:11 only. In this case I would get 40% less battery life, this would also explain all the problems many are complainig about with their units. They probably just keep the speaker at maximum. What's the difference between charging the Envaya with any USB wall charger (like this one mentioned above) and doing so with any regular cell phone charger? Would the latter damage the unit? Btw, great review! Definitely the most comprehensive one out there. Look at the charger's charge current rating (in amps) and make sure it's not higher than the battery's capacity spec (in amp-hours). The Envaya Mini has a 2600 mAh cell inside, so it should be fine to charge it at currents up to 2.6 A, though the ideal current is what Denon recommends in the manual, namely 2 A (prevents overheating and accelerated aging of the battery). Using currents lower than 2 A will not damage the battery, it will just prolong the charging process. Another thing to keep in mind is that it's best to disconnect the charger as soon as the Envaya's battery indicator turns off, because after that some misbehaving chargers might continue to slowly trickle extra charge into the battery and raise its voltage past the nominal 4.2 V, possibly damaging its internals and making it unsafe to use. Don't go crazy over the number of seconds or minutes you left the charger connected after the Envaya indicated its battery was full, just avoid leaving it to charge overnight or longer as much as possible (and this goes for anything with a rechargeable Li-Ion battery). "According to the manual the speaker will even automatically wake up from standby if you tap your NFC-enabled phone on the NFC-logo." Love your reviews. Big help in choosing which of the many small BT speakers. Bought both the DSB100 and the latest Charge 2 +. I cranked the JBL all the way up and found no distortion. Both sound great (JBL and dsb100). If the sound artefacts and distortion were no longer an issue on the JBL Charge 2+, would you still prefer the Envaya for sound quality and loudness? I must say I like that I can charge my phone off the the JBL, and can trust that battery to last longer than the dsb100. The JBL high side (treble) seems a bit more prounounced than the dsb100, and the bass a bit removed, though the dsb100 bass is nice, sometimes it seems to thrum throughout most songs - less punchy I guess, than the JBL. I am no audio expert, but appreciate good sound. Decisions Decisions. both are certainly top in this class and both sound different and can satisfiy different tastes. I like both, sometimes I prefer the Denon for particular genres (acoustic, jazz or even classic) sound much better and more realistic through the Denon, while the JBL has a more punchy sound and gives better results with Dance, R&B, HipHop and all those stuff. But the JBL exaggerates both high-end and low-end slightly, it is not bad, but just on sound quality alone the Denon has a much more natural sound, the JBL is more "fun" sounding and of course it has the better battery and some other great features the Denon is lacking. I still use both and like both. With the recent firmware update the JBL Charge 2 doesn't have any problems anymore either. Here in Sweden the Denon is 998 SEK and the JBL Charge 2+ is 1490 SEK. The question is, I listen mostly to the Dance/HipHop and stuff like that. No acoustic/jazz/classic. In your opinion is the Charge 2+ worth the extra cost? 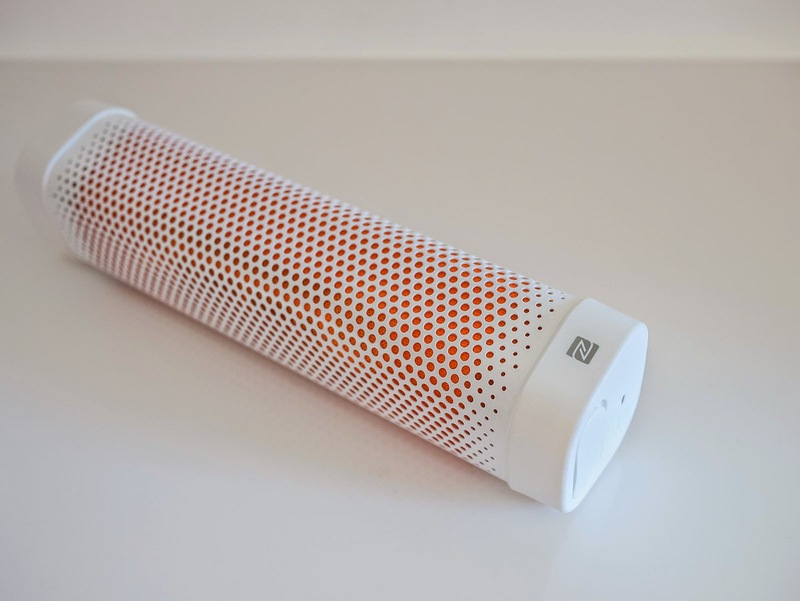 Take the normal JBL Charge 2, it should be cheaper now and is on sale in many places. My white mini has developed some stains, which are not going when I tried to clean with wet cloth. I just bought my denon envaya mini, after only 3 days isn't it working anymore .. I can't put it on or even charge it isn't working.. I you can help me? Your not alone. Mine has done the same thing, its only 2 months old! Only used it once a week. Waiting to hear back from Denon Australia in regards to repair/replacing. Had the same issue after only 2-3 months of home use only. It simply died while playing. The music stopped, nothing could be done and nothing was lit up anywhere. Denon excheanged it for a new one without any problems. I only had to wait 3 weeks as there were no in the warehouse in Poland! Has anyone else had issues with the Denon Envaya Mini? Mine simply won't charge or turn on. The last time I used it, the battery had been charged to 100%. However when I turned it on, the battery indicator light was flashing red, which I thought was odd. It played normally for 20mins, then turned off. Went to charge it, and the battery indicator light was not flashing. I have tried multiple methods of charging (different micro usb cables, computer charging, wall charging), but nothing. I'm rather disappointed as, the quality of sound was astounding. Also I have only had it for a couple of months! And I only used it several time a week. It would have only had 5 or so full charges. Any help would be appreciated. Currently waiting to hear from Denon Australia in regard to repair or replacing the unit. Had mine for 2 months, played it about once a week, indoors and out, recharged it mostly from mains and sometimes USB, no issues so far. The only strange thing I could mention relative to charging behaviour is that it absolutely refused to charge from a certain power bank I tried once, but I didn't investigate why - I just assumed there was not enough voltage at the output port of that thing. If you got it to the point where it completely refuses to charge again my only hypothesis is that you may have discharged the battery so much that you triggered its internal protection circuit, which interrupts the battery electrically so that it can't be discharged any further (which could kill it completely at that point) or charged again until the protection is disengaged. To disengage the protection you would have to put at least 1A of current through the battery for 5-10 seconds at a voltage that is the battery's "100%" voltage or slightly higher (so in this case probably something in the range of 4.3 - 5 V). Then the battery would "wake up" and be possible to recharge normally again (I've actually done this with an 18650 Li-Ion battery just like the Envaya's). The only problem with all this is you need access to the battery itself, you can't just do this from the USB port outside. If your DEM is still under warranty you better let the Denon technicians deal with it - either they will "wake up" your battery if it's simply been interrupted by its protection circuit or they will replace it if it's completely dead or has other ugly problems. At any rate, in general you shouldn't let the speaker play (at max. volume) until it completely drains the battery and turns itself off. Watch the battery indicator and turn the speaker off if it's blinking red (under 4%) and make sure to recharge it first chance you get after that. This way you should be able to avoid any potential issues with excessive discharging. Hello, have the same problem, after fully charge it played normally for 20 minutes, then turned off and still not working. I disassembled it and there was standart li-ion battery inside, with 4.0 voltage, which means for me that battery is alive. I can't imagine what to do next, to the nearest service is not less than 1000 km. So, anyone have any ideas what the problem and what should i check next? again, does the denon play whilst being charged unlike the sony srsx3? Also, can the battery be replaced ? Hi Alexander, seems to be just a bad battery. Mine took more than 2 hours to charge from a 2.4A 5V charger (the one that came with the JBL Charge 2). And at 50% volume it played close to 9 hours. I get more than 2 hours at maximum volume. I think that the used batteries are simply of bad quality. Meanwhile there are repeated complaints about bad or even dead batteries on new devices. I even think that Denon is working on a new updated model, thus so few units are available right now. i have 2 new Units from Amazon which Comes from the last Batch in early August (bevor it was sold out some time) i got on both appr. 3h playtime at maybe 90% volume! I also measured the charged capacity with an usb meter and charged 2850mAh! So it seems the 2600mAh 18650 Lithium battery is ok in my devices! Although one device never Shows green battery light after charging - still stays at orange! The other one is lit green after fully charged! did a runtime test at exact 40% volume at the envaya mini and got 8,5h ! this 40% volume are great for listening inside a room, maybe for someone just a Little bit too loud - just to get a Feeling! But will ship back my 2 devices and Keep the Charge 2(fw1.4.1) as there are no known battery failures or issues! So if Denon is working on an updated model, does this mean that there is a defect with the battery? Mine was fully charged and after only 20 days was dead needing a full recharge. i do not know if they are working on an updated model! But I'm really sure they used a bad Batch of batteries on their current Units - therefor the reports about battery issuis become more and more. If you unit's battery is empty after 20 days without playing Music then you should return it or try to get a warranty replacement from denon! Thanks for quick reply Oluv! As soon as I just bought this item recently - I will try to work this out with seller and get either money back or repairing. Anyway, disappointing things you should not have experienced buying new product. Maybe my experience will bring some value to people who are targeting to buy this item now, likely, it is not the best time to go ahead with this choice when stock is filled in with defective product, you should wait until Denon will fix the issue. I have used my Denon Envaya Mini for 6 months and now it's dead. I contacted Audiogurus about a repair/replacement but have yet to hear back. The warranty card says 1 year written in Japanese only. If I don't hear back from Audiogurus I'll try Denon. If no luck there, maybe I'll try to solder in a new battery? Man this thing was fun for a short time but $150 to use for a few months isn't a good value at all. No synced volume control is a dealbreaker for me. I need to be able to control the volume remotely with my MacBook. Any ideas on how to achieve this? I love the speaker otherwise, would be a shame to have to return it because of this. Someone please help! Is there a single Bluetooth speaker with synced volume control on a MacBook? So far I only had synced volume with iOS devices, but my MacBook Air didn't sync volume with any speaker so far. Interesting, because the JBL Charge didn't have synced volume implemented yet. This came with later models like Flip 2, Charge 2 etc. I'm not knowledgeable enough to know the how or why of it, but out of the box my JBL Charge first generation synced volume. Thank you for your reviews and comparisons. Recently bought an Envaya Mini and couldn't be happier! Long story short: yesterday I got my Envaya mini and I'm happy with it. Thanks for all the work you put in. Donation is on it's way. I got a Denon Envaya Mini as a loyalty card reward. Sweet. Mostly listen to Lounge, chillout, jazz and a bit of trance at low to medium volumes and the Denon has not disappointed, with a warm sound without being swamped with a booming bass. NFC and aptX are a real bonus for me. Using an Android phone with aptX and NFC, I am able to code the NFC startup via tasker and just tap the speaker with the phone and have everything start/turn on and play music. Even down to time of day/location and volume. Great review. I've owned a mini for about 3 months and I am very pleased. I wish I had stumbled on your review earlier, I would have jumped purchased this much more quickly. My biggest issue with it as you stated; is the battery life, but it's a small price to pay. Wow.. What a review! Definitely helped me make a right purchase choice. Thanks for this amazingly detailed and informative review. Just snatched two of these babies, one for home & one for the office! Thanks for your information. I am Chris in south Korea. Your posting helped me a lot while using Envaya mini and still I am using it. As many people said, mine also didn't last more than 6 hrs at 30~40% volume. So I decided to replace the battery into a new one, 18650 3200mAh. Now it's working pretty well lasting more than 12 hrs at the same volume. (I am still testing it how long it lasts but it might go more than 15 hrs) anyway, thanks for the disassembling video on Youtube!! Please provide some more information: the 18650 3200mAh battery is with overcharge, also discharge protection? What about the high drain current: 4A, 10A, 30A? Which is better for this kind of device? Thank you! As i understand from Admin's comments, TDK A33 is louder than Envaya Mini, is it also better sounding when compared both at say 90% volume? Which one will you recommend for listening to Rock/Pop music at home (not as a background music!) as far as overall sound quality, bass/treble response is concerned? Just bought it. Your comments make it really desirable and promising. At this moment the envaya is discontinued but I am enjoying it for 60 euro.